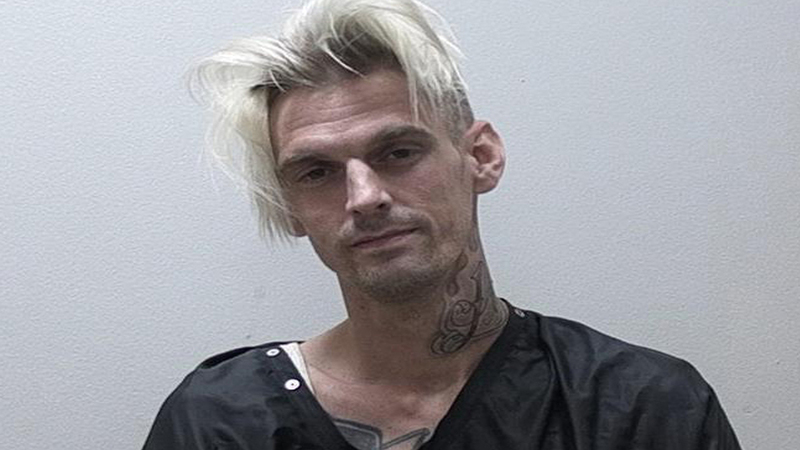 ATLANTA -- Pop singer Aaron Carter was arrested after another motorist called 911 to report that the musician was "driving all over the road" on a Georgia highway, sheriff's officials said Monday. While being questioned, Carter was unable to maintain his balance, and his eyes were "blood shot and watery with a glazed look to them," Habersham County sheriff's Deputy Brandon Holcomb wrote in his report. "He was driving all over the road and driving into the median," sheriff's Capt. Floyd Canup said. The deputy then watched as Carter, wearing a white fish-net tank top and black shorts, got out of the driver's seat of the white Chevy Suburban and walked toward the store entrance, the deputy wrote in his report. Carter's girlfriend, Madison Ann Parker, 26, of Studio City, California, also was arrested with Carter Saturday, She was charged with obstructing or hindering law enforcement officers, possession of marijuana and possession of drug-related objects, jail records show. After the marijuana was found, Holcomb asked Carter and his girlfriend who it belonged to and "they both stated it belonged to the other," the deputy wrote in his report. Parker also became belligerent, and was handcuffed after refusing to sit on a curb as the vehicle was being searched, Holcomb wrote in his report. She somehow managed to slip out of the cuffs at one point, and was later strip-searched, deputies said. During that search, performed by a female deputy, an item believed to be a marijuana joint was found as Parker began taking off her pants, deputies wrote in the reports. Carter failed field sobriety tests, and refused to provide blood or urine samples, the deputies said.